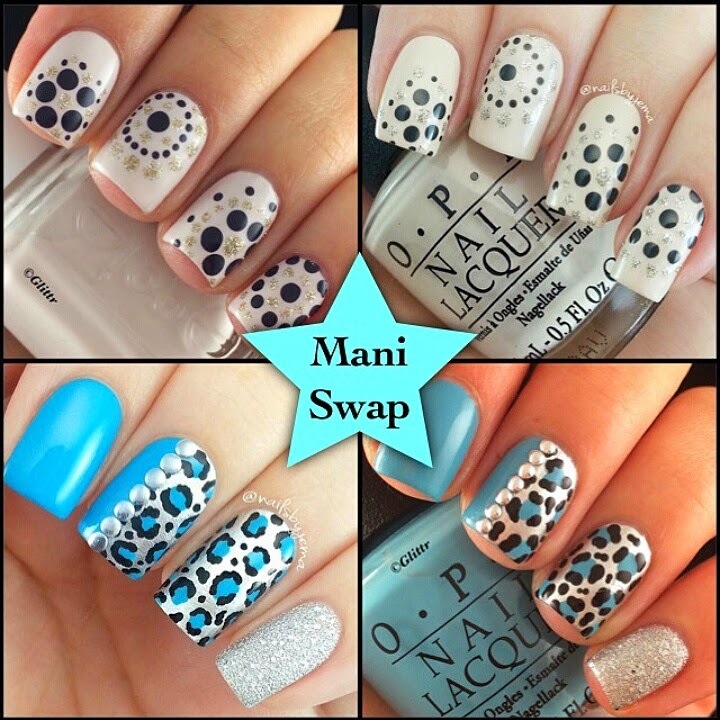 Can you believe this mani swap is 4 months in the making?! The super sweet Shanna aka @glittr asked me if I wanted to do my very first mani swap with her & I was super excited... till I broke my nails and was down to nubs so we had to wait till they grew out a little. This was the third design of hers I did because they are all just so pretty and my style and I loved them all so I let the birthday boy choose which one made the final cut. He loved her kickass dotticure straight away. Shanna recreated my blue studded leopard and smashed it! Hopefully it didn't stain your nails like that mani stained mine girl!! Originals are on the left and our recreations are on the right. Thank you so much Shanna for being my first mani swap.. they say you always remember your first ;) haha If you aren't already following her, do yourself a favor and do it now!! She has a fantastic blog you can see here.